(NaturalNews) New cases of diabetes continue to increase at an exponential rate, as the list of biomarkers collectively known as metabolic syndrome (MetS risk factors include obesity, high triglycerides, low HDL cholesterol and elevated blood pressure and blood glucose) are known to triple the risk of developing cardiovascular disease and death from a heart attack. Although heart disease is the leading cause of death in most western societies, it is also largely preventable through dietary modification, increased physical activity and attention to mitigating lifestyle factors. 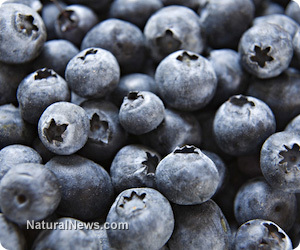 Altering diet to eliminate sugar, refined foods and hydrogenated fats while increasing monounsaturated fat sources, lean protein and superfoods, including blueberries, has been repeatedly shown to lower heart disease risk by improving metabolic syndrome risk factors. Researchers from the University of Maine, publishing in the journal Applied Physiology, Nutrition, and Metabolism have found that a regular diet consisting of wild blueberries may help improve or prevent pathologies associated with the metabolic syndrome, including cardiovascular disease and diabetes. Wild blueberries are a rich source of phytochemicals called polyphenols and have been reported in a growing number of prior studies to exert a wide array of protective health benefits, including lowering risk from Alzheimer's disease and certain forms of cancer to diabetes and cardiovascular disease. Using a mouse model known to closely simulate metabolic syndrome in humans, the scientists fed the equivalent of two cups of wild blueberries per day for a period of eight weeks and found that they were able to regulate and improve the balance between relaxing and constricting factors in the vascular wall, improving blood flow and blood pressure regulation of obese Zucker rats with metabolic syndrome. Lead author Dr. Klimis-Zacas commented, "We have previously documented the cardiovascular benefits of a polyphenol-rich wild blueberry in a rat model with impaired vascular health and high blood pressure. Our new findings show that these benefits extend to the obese Zucker rat, a widely used model resembling human MetS." Statistics show that an estimated 37 percent of the US population is at risk for metabolic syndrome, and small changes to diet and physical activity can be sufficient to reduce the risk of developing diabetes and cardiovascular disease. Dr. Klimis-Zacas concluded, "Our recent findings documented that wild blueberries reduce chronic inflammation and improve the abnormal lipid profile and gene expression associated with the MetS." This new study demonstrates even greater potential to show that "by normalizing oxidative, inflammatory response and endothelial function, regular long-term wild blueberry diets may also help improve pathologies associated with the MetS." Many past research studies have shown that consuming one to two cups of blueberries several times per week, or supplementing with a standardized anthocyanin extract (400 mg daily) can significantly reduce the risks associated with developing diabetes and vascular disorders.